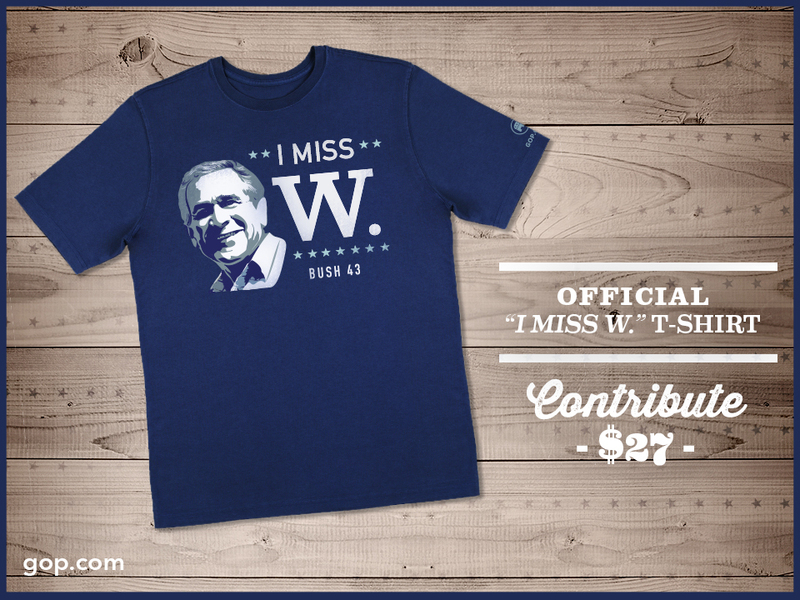 In a tone-deaf attempt to rehabilitate the 43rd president, the Republican National Committee is selling “I Miss W” shirts to commemorate George W. Bush’s 68th birthday, which was Sunday. RNC Chair Reince Priebus unveiled the new item on Saturday, demanding that his Twitter followers “restore GOP leadership & get this shirt.” Now, for a mere $27, you can proudly display your fondness for ol’ G.W. with a stylish navy-blue tee. There are two different styles: One only has text, while another has a doofy, smiling image of Bush that looks suspiciously similar to Shepard Fairey’s “HOPE” poster of Barack Obama from 2008. Of course, Bush was anything but a “principled conservative:” He significantly expanded the government’s involvement in health care (Medicare Part D) and education (No Child Left Behind, which imposed federal standards on local municipalities). He pursued an aggressively interventionist foreign policy in the Middle East, blew up the national debt, and authorized massive government involvement in the financial sector after the financial crisis. Even most conservatives now admit that Bush wasn’t a conservative president — but then again, he’s not Obama, so maybe that itself is enough to sell some T-shirts. But is the world ready for an “I Miss W.” t-shirt? In a recent poll, over a quarter of respondents (28 percent) called Bush the worst president since World War II, and in a 2010 poll of presidential historians, he was named one of the five worst presidents of all time. He also left office with a 34 percent approval rating; while that’s creeped up to 46 percent since he left office, he’s still in the red, as 51 percent have an unfavorable view of him. Nevertheless, Priebus is betting that Republican donors who happen upon the RNC website will, due to their endless reservoir of hatred for President Obama, ignore Bush’s wholly-unconservative legacy, tarnished public image and ballooning of the national debt, and “get this shirt.” Then again, there’s got to be someone out there who really does miss the Bush presidency and can’t wait to get their hands on this shirt, so...more power to ‘em, I guess?